If you know me, you know I’m a sucker for all things mythological – and is there a better time for such matters than just after the winter solstice, when daylight begins returning to the world northern hemisphere and cultures throughout history have some sort of festival to celebrate? Well, sure there is, and I could think of an excuse to do a mythology category no matter what time of year it is. But whatever the post-hoc justification, the 34th installment of Deeper into Jeopardy! will deal with the simply-titled DJ! category of MYTHOLOGY. By the way, does it bother anyone else that the term “mythology” always seems refer by default to Graeco-Roman mythology? No, just me? Oh well. It’s my blog. I count the grains of sand on the beach and measure the sea; I understand the speech of the dumb and hear the voiceless. The smell has come to my sense of a hard shelled tortoise boiling and bubbling with a lamb’s flesh in a bronze pot: the cauldron underneath it is of bronze, and bronze is the lid. If a Greek wanted to get a prophecy from Apollo, they would first have to make the journey to Delphi, which was in Athenian territory on the north bank of the Gulf of Corinth – no mean task for some in the Greek world, for example someone coming from the Turkish coast or even all the way from Greek Italy. Next, they were elaborately prepared by the Temple staff (probably not by the Pythia herself), including being screened for their questions and giving offerings to Apollo and donations for temple’s maintenance. After extensive preparations, they were led into the adyton, the normally forbidden sanctum sanctorum of the Greek temple, where they would pose the question and hear the Pythia’s usually very cryptic reply. Finally, they were forced to interpret the response on their own, and decide whether and how to act on it – handily for the temple, since an unwanted result could be (and was, regularly) attributed to a misinterpretation. For example, after Croesus was duly impressed by the Pythia, he asked what would happen if he declared war on the mighty Persian Empire. His response was that “a mighty empire would fall,” which he took as welcome news. Unfortunately, in his hubris he assumed the fallen empire would be that of the Persians, when in fact it was his own that fell. The Pythia had also told him that his rule would last until Persia was ruled by “a mule,” which Croesus took for an impossibility – but Cyrus, the Persian king, was half-Mede and half-Persian, making him the very “mule” (another mixed creature, born of a horse and a donkey) that would cause Croesus’ fall. 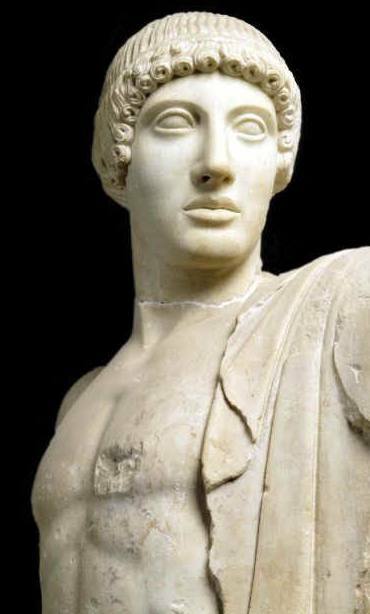 A sculpture of Apollo from the pediment of the Temple of Zeus at Olympia (none of the statuary from the Temple of Apollo at Delphi survives). Note his lack of beard, one of Apollo’s distinguishing features. The clue: This clue’s just chock full of hints, both general and specific. First, the son of Zeus – most of the well-known gods (this is a $200 clue, after all) are the sons of Zeus, but it does rule out his brothers Poseidon and Hades (and any goddesses, of course). Then there’s the mention of oracles in general, followed by the specific mention of Pythia specifically, both closely associated with Apollo. Finally, and perhaps more helpfully than Pythia (it’s hard for me to judge these things, since this is exactly my former area of study), it mentions Delphi, where the most famous temple of the god is located. While not hard persay, it still strikes me as not easy for a $200 clue. Searching for “Apollo god” returns a more manageable 28 regular clues and an FJ! clue. Many of the common themes are present in this clue: Pythia (or Python, or Pytho, Delphi’s older name) are mentioned in seven regular and the FJ! clue; Delphi in six regular and the FJ! ; oracles or prophecies in seven and the FJ!. Apollo’s twin Artemis (both born to Leto) appears in ten. A couple of Apollo’s better known dalliances make appearances as well: the nymph Daphne, who he transformed into the laurel tree, is in six, and the prophetess Cassandra, who scorned Apollo and was punished with the gift of prophecy and the curse that no one would ever believe her, is in four. As you’re probably starting to tell, Apollo is a complicated god – there’s many tacks the writers can take and have taken to ask about him, and none dominates very much over the others. Just one common mistake to keep in mind: Apollo’s solar association is in four clues, but remember that Helios was also a sun god – he’s the one who rode the chariot across the sky, and he’s the one depicted in the Colossus of Rhodes, not Apollo. Contestants seem to get that mixed up quite often. *Philadelphia’s name is Greek for brotherly love,” hence its nickname “the city of brotherly love.” Delphi’s is actually unrelated, being derived from Greek “delphis,” from which we get our word dolphin. According to the Homeric Hymn to Apollo, the god assumed the form of a dolphin in order to carry the first Delphic priests to his new shrine from Crete.